Good times on Hutchinson Island. Christmas day 2014 we drove Great A’Tuin to the beach for a picnic, then parked AT overlooking The Jensen Beach to Jupiter Inlet Aquatic Preserve and hung out in AT’s back, drinking a few beers and playing cards. Itâ€™s early March. Our sailing season was cut short. We are staying in my parentsâ€™ house in Hobe Sound, FL. In three months we will go back to Cabbagetown for the summer. We already have house and pet sitting gigs lined up there. We have our 2000 Honda Civic. 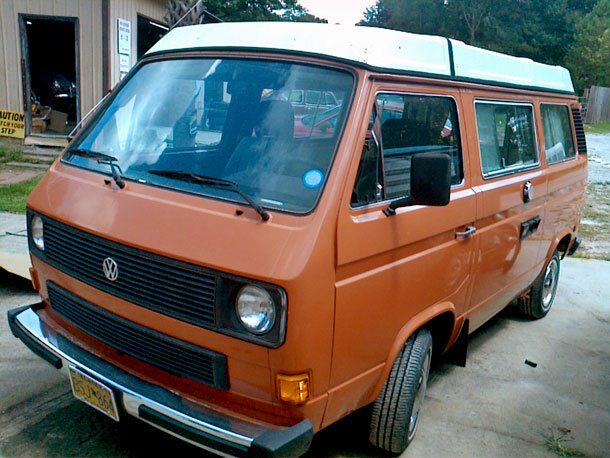 And our inert 1982 VW Westfalia camper van sits in the garage. My parents should sell this house. They used to spend half of each year here, but they havenâ€™t done so in a while. Itâ€™s a convenient place for us to keep our extra stuff. But thatâ€™s no reason they should own a house. We all agree. Itâ€™s time to sell. Duwan and I should be able to get this place to market in three months. But the van? 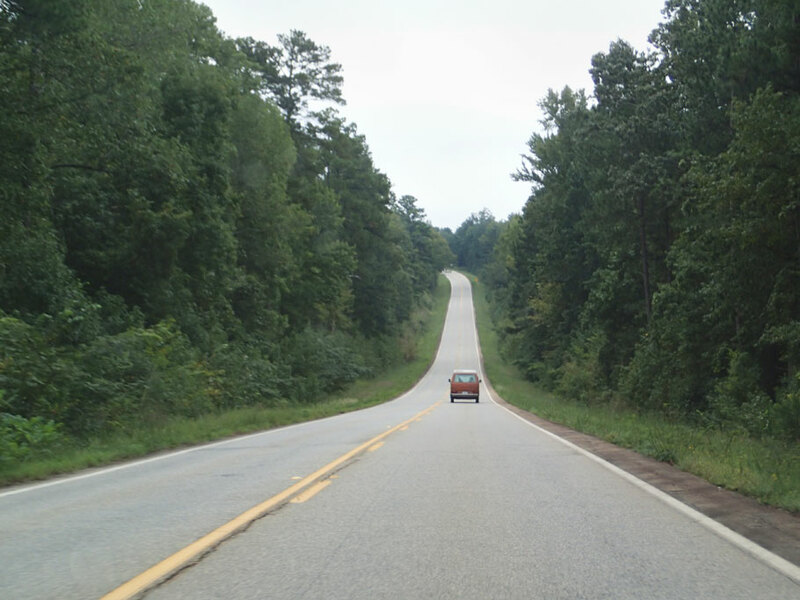 Youâ€™ll remember we threw a timing belt in Nowhere, Alabama and towed the van down here. What are our options now? Option one is to tear into the engine and fix the current problem. Itâ€™s probably a bent rod. I would LOVE to try this. Iâ€™m sure I would learn a lot. But, this 58HP 1.6 liter diesel engine never had the power to run the van. The top speed was 55MPH, and it took over a minute to reach that in flat Florida. On hills we used to back up traffic and enrage all the drivers behind us. Option two would save some time. I could buy another 1.6L diesel VW engine and drop it in. But weâ€™d still be under-powered. VW also made a 1.9L diesel that would fit in this engine compartment. That would increase the power. Weâ€™d need to change the transmission gearing or replace the whole transmission. Option three looks OK.
Option four would be to drop in a Subaru 2.5L gas engine. This would give us all the power we require. Weâ€™d need a conversion kit and an upgraded or new transmission. This option looks good. I could save money and learn a lot doing the work myself. But the price tag is $10K or more, and I would need a lot of time. One day I went to the library to do more research on transmissions. It became clear to me I would need to do a lot more reading before I could start buying parts. Then I would need weeks to do the work. When I came home Duwan said she didnâ€™t think we had time to fix the van and sell the house both. I told her I was coming to the same conclusion. Given the amount of money we would have to spend, we could put that money toward another van. If we were going to sell the house, we needed to part ways with the Great Aâ€™Tuin. We had no idea how much to ask for a van that wouldnâ€™t run. There were some comparables in California, but not many on the eastern seaboard. We put it on Craigslist with a bunch of pictures. We got four bites in the first two hours. The first person to arrive said he could have the money and a tow truck in the morning. We agreed. It was sad to part with Aâ€™Tuin. Sometimes I feel that we let AT down. But more often I think that AT let us down. Hereâ€™s the good news. The new owner has a wife and young girl. They family wants to use the van to camp out locally on the weekends. The owner found a VW Rabbit engine and dropped it in (our option two). And AT is creeping off to new adventures. 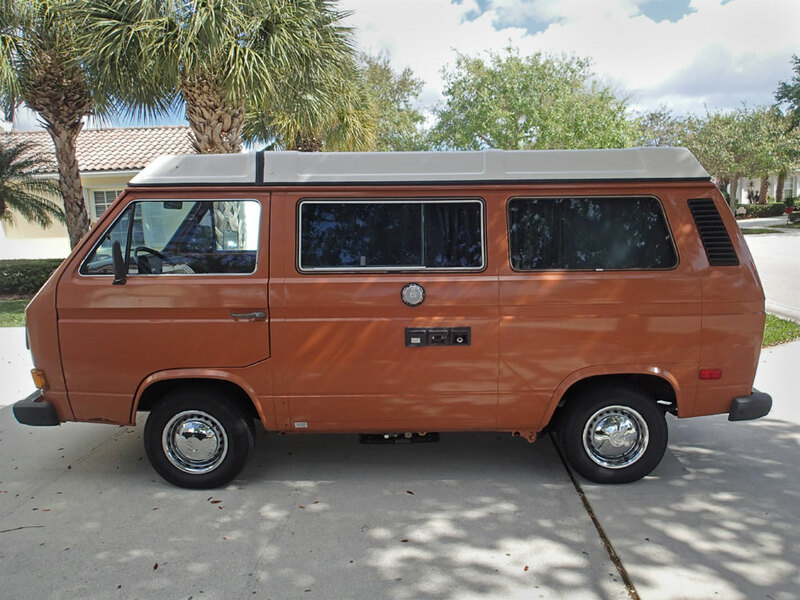 We spent a lot of time looking for a Westfalia Camper Van online, bookmarking vans for sale across the country. We had planned for 3 weeks to hit the road and check out each van in person — then one popped up in Georgia, a few hours drive away and it was Great ATuin! 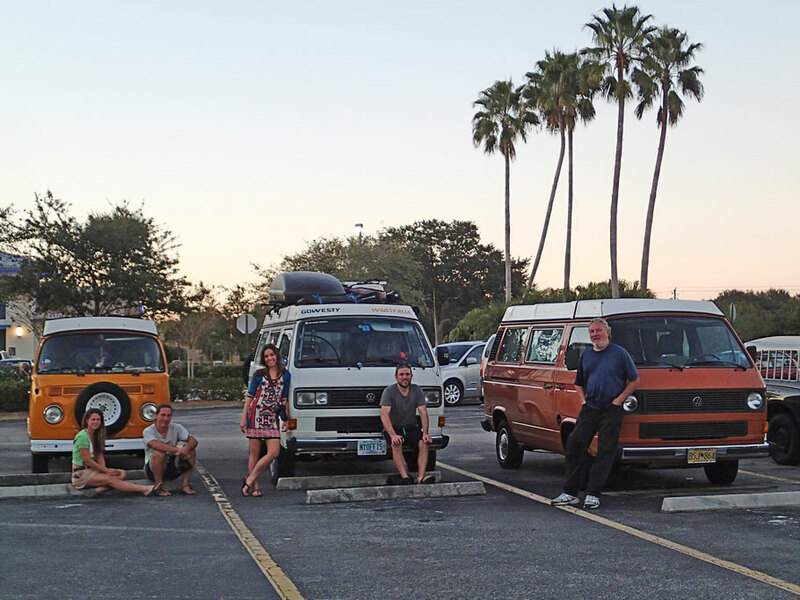 Check out the blog post Finding the Westy to relive our experience finding AT. 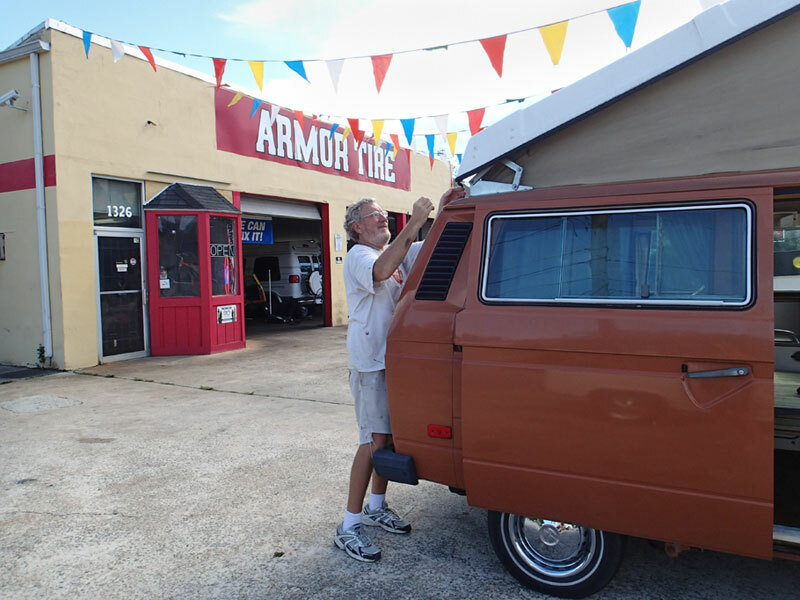 We knew A’Tuin had a few problems when we made the purchase, so we drove to a mechanic right away. AT was in the shop for 3 weeks. Apparently old Westfalias are a little confounding mechanically. It was our first lesson in waiting for AT. Check out the blog post Limbo for a day by day accounting of our waiting. As soon as we got Great A’Tuin back from the mechanic it was time to race to Florida so AT could be come a Florida resident just like us. It was a somewhat eventful trip, but good to finally be going somewhere. Check out the blog post Shake Down Cruise Day 1 to learn about Greg’s lost wallet, AT’s fuel tank leak, and our little brush with the law. The return trip from Florida was WAY more eventful than the trip down. AT broke an injector tube. Although we were able to jury rig the tube, the drive back was a slow one on rural roads. We had to stop every 30 minutes to pour fuel back into the diesel tank, Greg had to wear a bandana over his mouth and nose in order to not be totally asphyxiated. We got lost, had encounters with cops, but finally arrived back in Cabbagetown in the wee hours of the morning half a day late for our next house sitting gig. Check out the blog post Shake Down Cruise Day 2, if you want to amazed by our stamina and resolve. Friendly cop helping Greg look at engine. 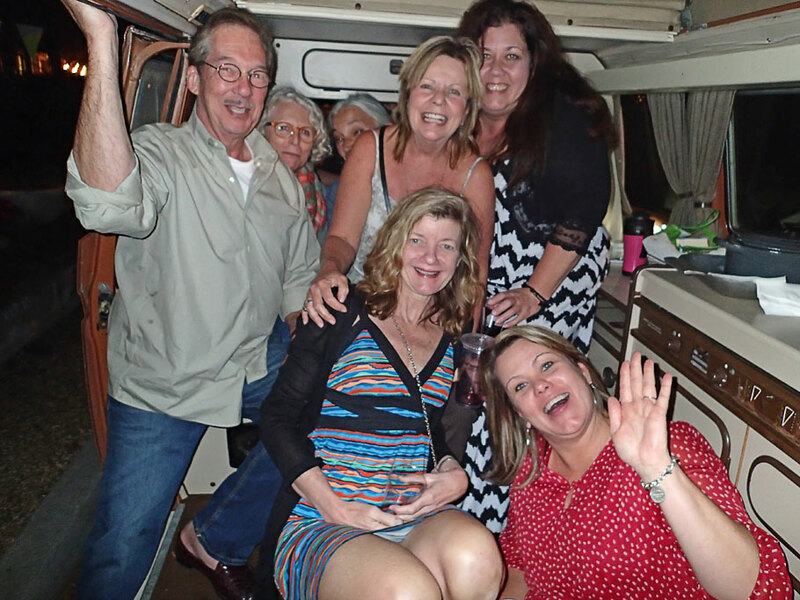 If you are curious whether we ever had any fun times with Great A’Tuin, check out the blog post Van Party, Alright! So despite A’Tuin’s 3 weeks in the garage, AT still had some problems – the worst of which was so much black exhaust that people would pull along side as we were riding down the road and tell us AT was on fire. After we got back to Florida that fall, Greg started doing lots of research and set to fixing some of the many problems, including the massive amounts of smoke A’Tuin was spitting out into the environment. If you’d like to know what Greg fixed and how he did it, check out the blog post Toys. 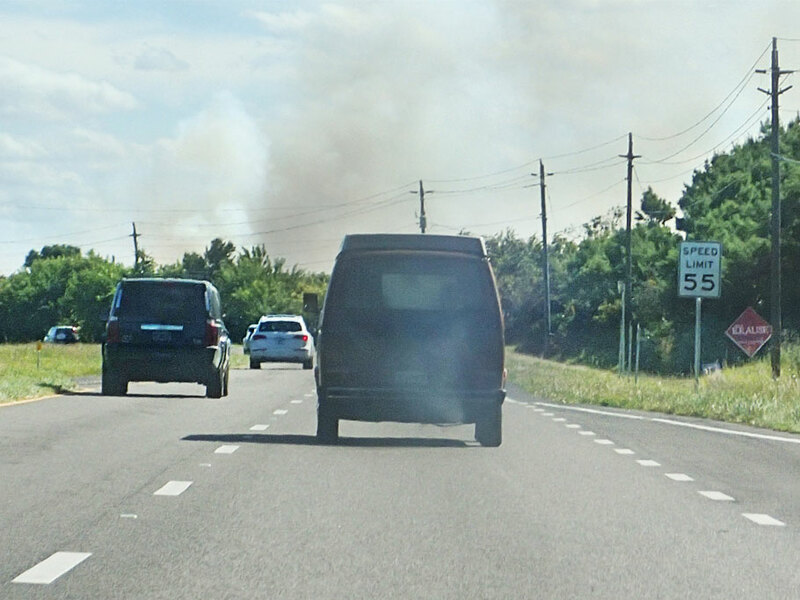 Coal rolling down the road. Since we were contemplating a life as part time van dwellers, Duwan had been reading lots of van blogs. One day, one of those blogs, Where’s My Office Now, made a call for nomads to be a part of their nomad web series. Duwan wrote them a note and they came to visit us with their cameras, recording equipment, and youthful idealism and enthusiasm a few months later. They interviewed us on the boat, then came back to Greg’s parents house, they made us all dinner and slept in their vans in the driveway that night. If you would like to read more about this experience check out our blog post, The Van Gang. If you are interested in the video they made with us check it out here. The van gang. Rachel and James with Sunshine, Emily and Corey with Boscha, and Greg with Great A’Tuin. 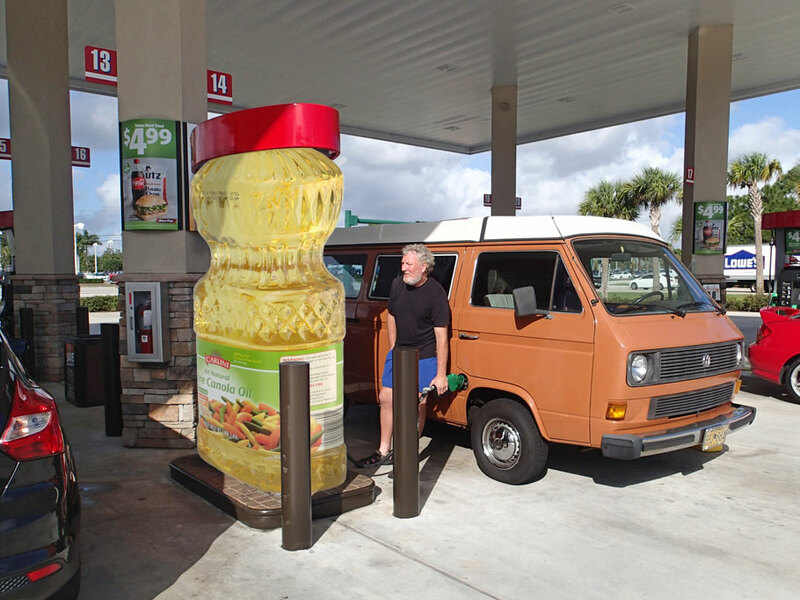 One of the reason we bought this specific van was because it was a diesel and we wanted a diesel because we wanted to convert it to drive on veggy oil. If you are curious as to why we wanted to fuel AT with diesel check out the post Why WVO? Filling up on veggy oil! Although we never finished the project to convert Great A’Tuin to run on veggy oil, we did start it. To find out what we did do, check out the post WVO Phase I. So, for all the WVO effort, here is the only visible difference: AT is now sporting tinted windows. After all the work we put into Great A’Tuin we were ready to finally go on an adventure with AT from Atlanta to New Orleans. It didn’t last very long. We broke down in Alabama, just a few hundred miles out of Atlanta. We were disheartened, but not defeated yet. 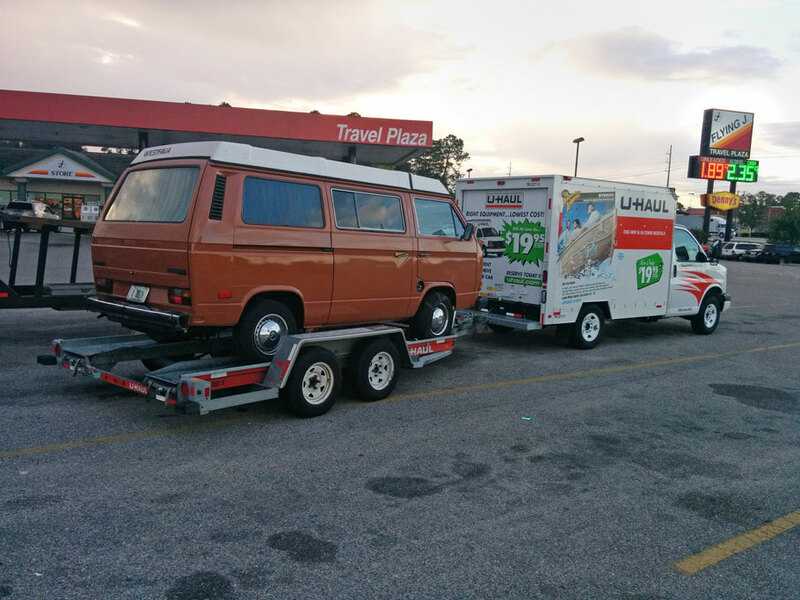 We had AT towed to a hotel, spent 3 days waiting for a part that didn’t help, then took a bus back to Atlanta, got our car, rented a U-haul and towed Great A’Tuin to Greg’s parents garage in Stuart, Florida. For more on this final failed adventure in AT, check out the blog post A Little Adventure in Great Aâ€™Tuin. Ready to leave the Flying J. 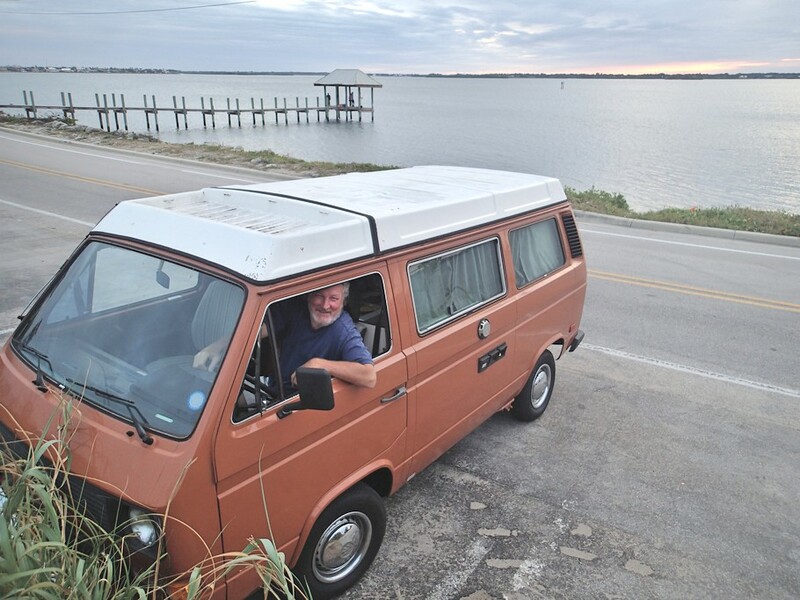 This entry was posted in Van Life, Vanagon Westfalia and tagged goodbye, vanagon, westfalia. Bookmark the permalink.